Za’atar reminds me a little of Mary Poppins: you can keep subtracting from its container and yet you’ll never finish the magic ingredient. 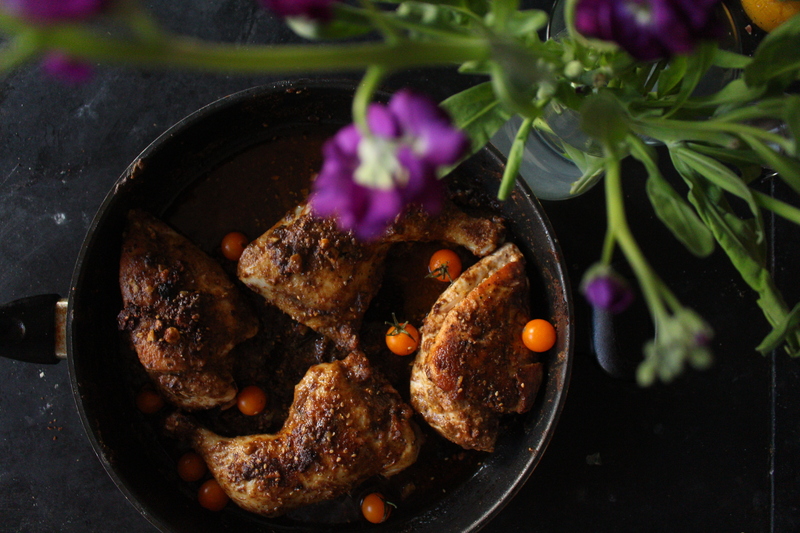 This za’atar was a gift from Aslan’s grandmother Alicia,s who makes it from scratch. She magically dries and grinds all seven the spices, also picking out all the bad sesame seeds to make a perfect mix of spices that one can never seem to finish. Apparently, za’atar recipes are different in every household and were usually kept secret, even from the daughters, and thus, no one really knows the exact spices that were used. In Mexico, sumac has been substituted with hibiscus, which gives it the same tangy flavour and red colouring. It is believed that za’atar strengthens the body and alerts the mind, even Maimonides prescribed it. 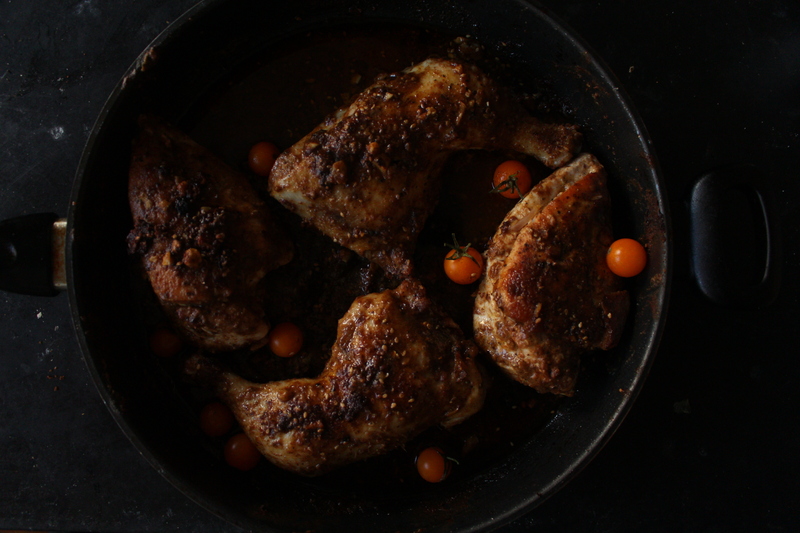 I made this recipe up and I’m very happy to have the video because otherwise I would not have remembered my ingredients. 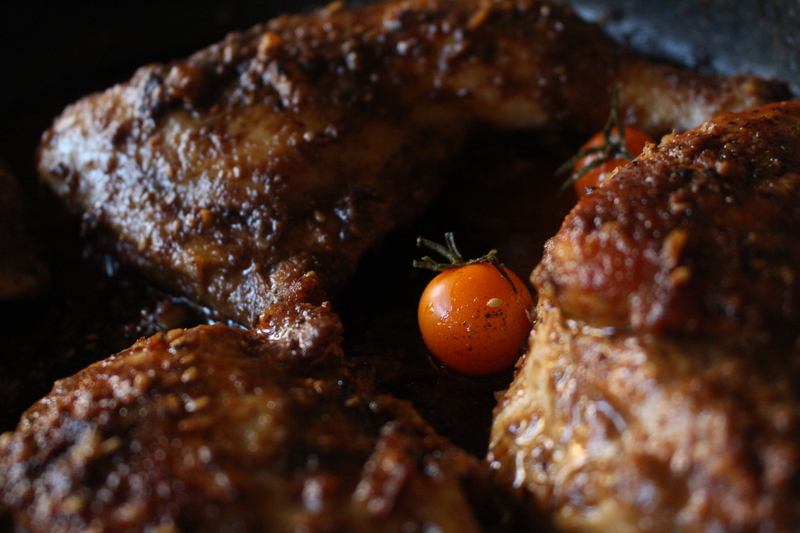 Aslan says this is now his favourite chicken recipe EVER. So try it out. 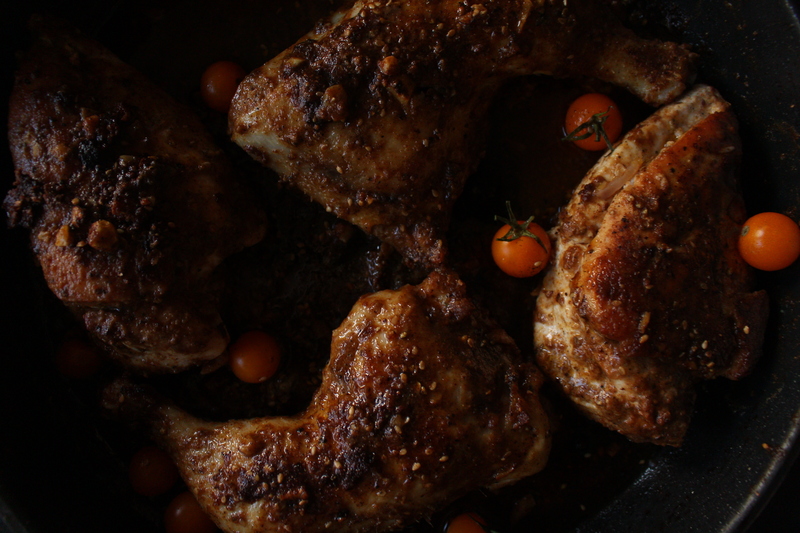 Heat a large oven-safe skillet with olive oil. Season the chicken with salt and pepper and brown on the skillet from both sides on high heat. Preheat the oven to 400ºF. Prepare the marinade by combining the lemon juice, garlic, paprika, cayenne pepper, za’atar, cinnamon, olive oil and pepper. Cover the chicken with marinade and let rest for at least 30 minutes. Switch the oven to Broil and place the skillet on the lowest rack for 20-25 minutes until the meat has cooked through, spooning with sauce half-way through. When ready to serve, decorate with cherry tomatoes, parsley, or lemon wedges. El Za’atar me recuerda un poco a Mary Poppins: puedes sacarle y sacarle y nunca se va a terminar. Este za’atar fue un regalo de la abuela de Aslan, Alicia, que después de un año de usarlo en huevos, pollos, pastas, ensaladas, etc, sigue casi lleno. Alicia hace su za’atar en casa, seleccionando a mano casa especie, moliendo, secando, y mezclando para tener la mejor mezcla posible. El za’atar se conoce desde tiempos Bíblicos y se utilizaba para sacrificios y purificación. Se creé que ayuda a fortalecer el cuerpo y agilizar la mente, hasta el mismísimo Rambam lo recetaba. Aunque sigue siendo un misterio la verdadera combinación de ingredientes, cada casa conoce su propia receta. En México, las mujeres llegadas de Siria tuvieron que sustituir el sumac por jamaica que le da un sabor parecido, ácido y color rojizo. Aslan llamó ésta receta su nuevo pollo favorito. Confíen en su paladar. Calentar un sartén para el horno con aceite de oliva. Sazonar el pollo con sal y pimienta y ponerlo a dorar en el sartén por ambos lados. Precalentar el horno a 400ºF. Preparar la salsa combinando el limón, ajo, thine, papríka, pimienta cayenne, za’atar, canela, y aceite de olivo. Cubrir el pollo con la salsa y dejar marinar por lo menos media hora. Cambiar el modo del horno a parrilla/broil y meter el sartén en la parte más baja del horno. Dejar cocinar por 20-25 minutos hasta que la carne esté cocida. Decorar con tomatitos cherry, perejil, o rebanadas de limón.